Welcome to Episode 2 of Your Brilliant Un-Career, the podcast. In this solo show I share the story about how picking up a hitchhiker changed the course of my life and my career. I explore listening to your gut and taking risks. When you’re seeking advice about decisions, don’t forget to include yourself. You have innate wisdom, so tune in to it. If you need some encouragement in relation to taking the leap or making big decisions and moves in your business, this is for you. 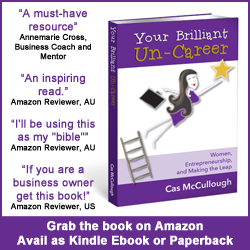 I am the author of Your Brilliant Un-Career and How to Create a Magnetic Marketing System. After a near death experience, in 2010 I founded my first startup and now juggle running a successful content marketing agency, a tech startup, and my online training programs from my Brisbane-based home office while solo parenting and home educating my three boys. Chapter 3 of Your Brilliant Un-Career talks about overcoming barriers to success. The last section in this chapter shares the diving board story I refer to in the show. I have done a terrific interview with Alison Vidotto, CEO of the Vidotto Group and author of 22 Leadership Fundamentals on this chapter of the book. You can access that for free here, along with 32 other business building podcast interviews, templates, worksheets and motivational affirmations.